Get books off your shelves and into the hand of your students! 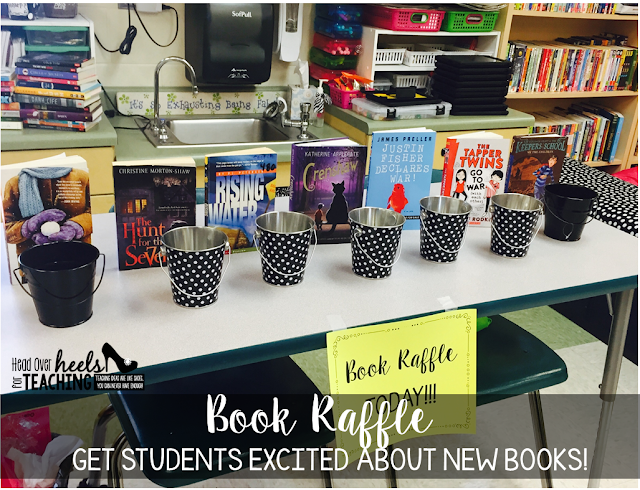 I've always displayed new books on my book displays, and it's usually first come, first served, but it's way more fun to have a BOOK RAFFLE! The way I'd like to start doing book raffles differently is to have them on set days so my students can't wait for the introduction of new books! Then I'll just display my sign, books, and buckets and let the excitement begin! 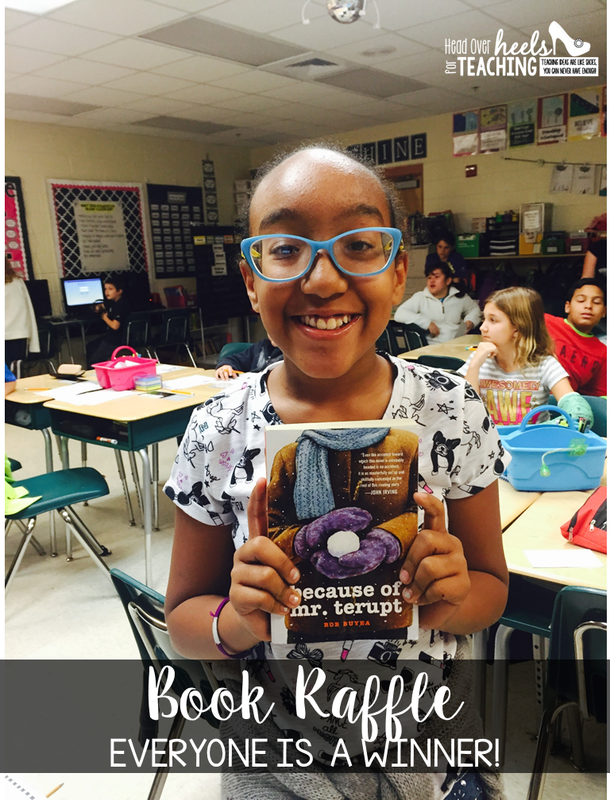 What are book raffles? 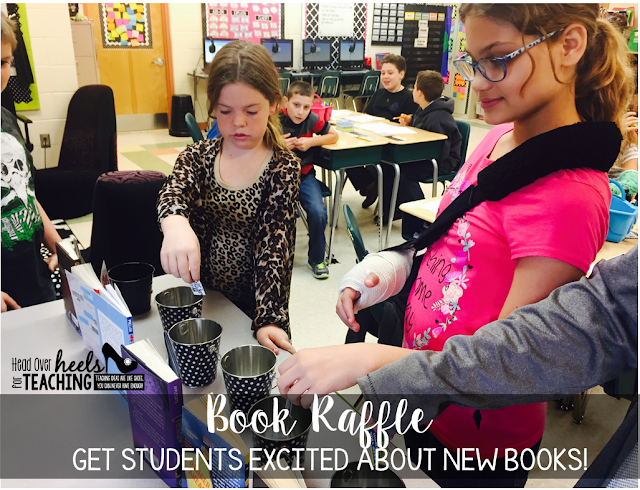 When you get new books (not necessarily brand new, but new to your classroom), you let your kids enter to "WIN" a chance to read that new book. In order to build excitement, I had them displayed all day with no explanation and they're not allowed to touch them!! :) (Makes them want them more!) I do a short book talk on each book (short summary, genre, reading level). For the books I haven't read, I allow students who've read the books to do a short talk, or you could find a YouTube video on some too. Even reading the summary on the back of the book would work! Just giving them enough information and a description to make your students want to read the books! 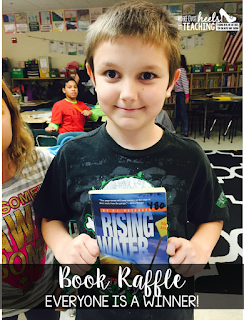 Each student gets one ticket to choose the book they want to read most. 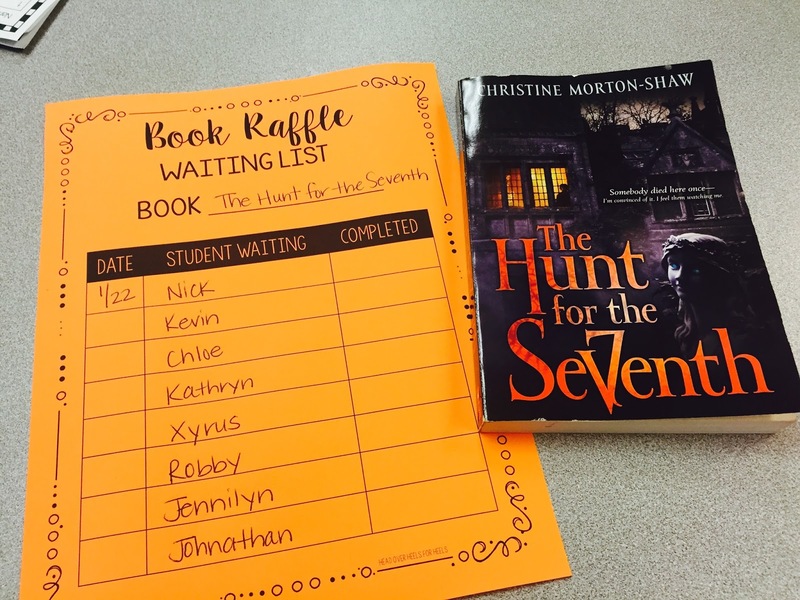 There's no set number of books to have a book raffle, but you need to allow time to talk about each book. I have about 6-7 books. See? Building excitement about reading! You would've thought I was giving away a gift card to a toy store! LOL! The good news...EVERYONE is a winner! The students who won the chance to read the new book are reading and the ones who didn't WANT to read it! They get put on a waiting list. Depending on the length of the book I give each winner a date to complete the book. If they don't finish before the due date and there's a waiting list, they have to return the book and give it to the next person. The book pictured below was a big hit! I think because they're all into scary movies right now, this scary book enticed all of them! 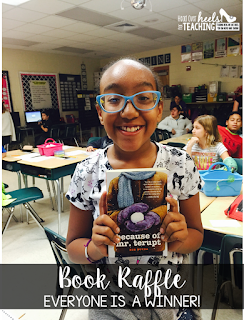 If you haven't tried Book Raffles, you need to! 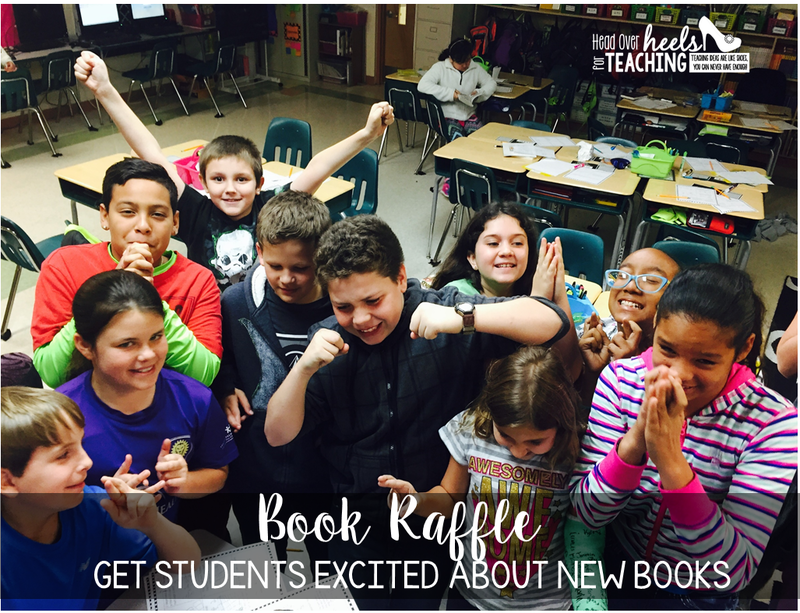 You and your students will love the excitement about books and reading! You don't have to buy new books...my big hit book above was ten cents at a thrift store! Score! 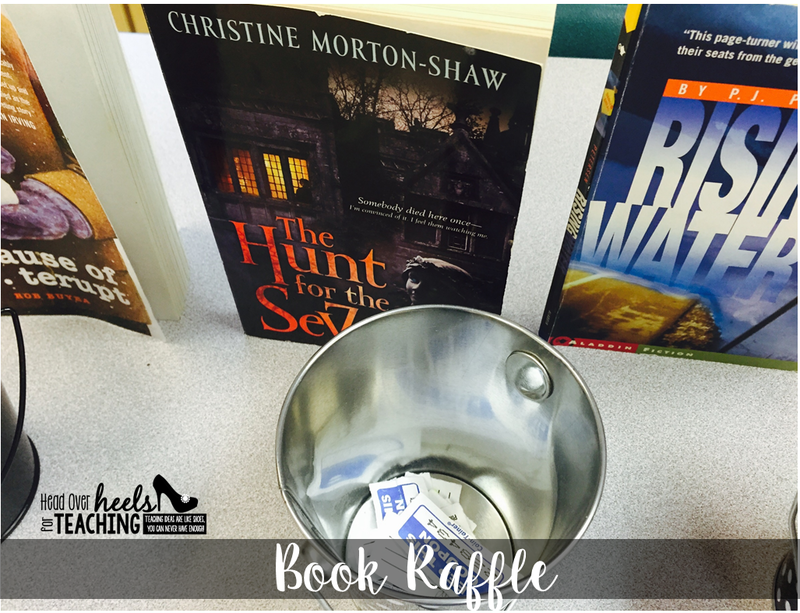 Want a copy of the Book Raffle sign and waiting list? Click here to get a copy. 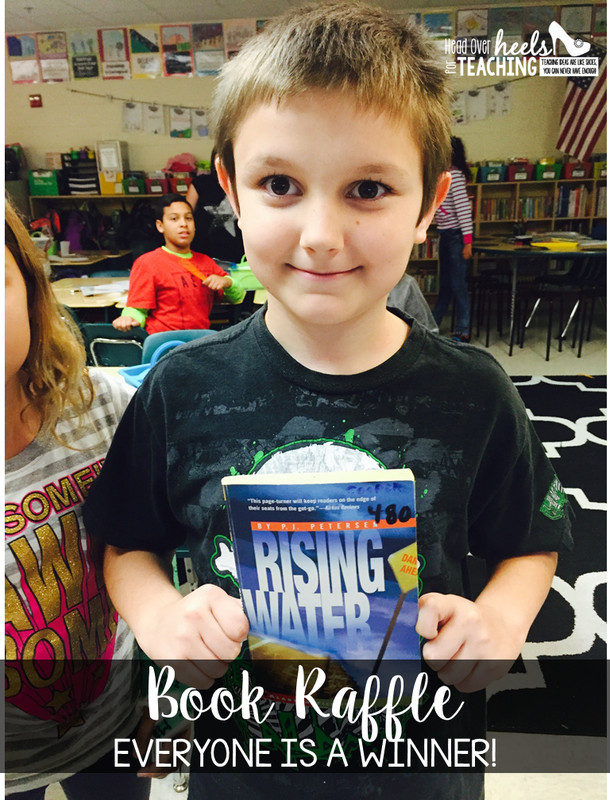 I love book raffles!! I started doing them last year in my classroom and my student's loved them!!! I love your waiting list to go with them too. I have never used a waiting list but am going to try that next week with my book raffle. Thanks for the idea! Thank you for sharing this wonderful idea. When I click on the link to get the waiting list, nothing happens. Is the link working? I'm very interested in starting this next week! I would love to link up on the regular. I'm setting this Saturday on calendar to link up! This post was great! You always have such wonderful ideas! Amazing and biggest selection of books thanks for share it corporate identity package . Oh! That`s great!!! What useful ideas!!! I`m a teacher, and it is important for me to get such kind of advice to use in my classes. Once more moment, it is usual for me to find and to read different book review like that to understand a book without reading it (it can be I have no time...). Could I allow this? Could you recommend me some other services to use? قومي بنثر رماد الخشب على الأوراق لتجنب تكون العفن عليها الثوم والفلفل الحار كلاهما من الوسائل الفعالة ضد الحشرات التي تتواجد في الحدائق ، و يستخدم كل منها على النحو التالي : قومي بخلط ثلاث من فصوص الثوم في الخلاط الكهربائي ، و ذلك بعد ملئ نصفه بالماء ، ثم يصفى الماء مع الإضافة عند الحاجة ، ويمكن إضافة ملعقتين من المولاس إلى الخليط . أما الفلفل الحار فيحضر كما يلي : يخلط نصف كوب من الفلفل الحار مع كوبين ونصف الكوب من الماء، مع تصفيته بعد أن يمتزج تماماً ثم يخلط مسحوق صابوني سائل أو منظف مع هذه المياه التي سيسقى به الزرع لإبعاد الحشرات عنه . Spark Student Motivation: Tune Tuesday!! Spark Student Motivation: Get Up and Moving!